Jason Rohrer's A Game for Someone isn't meant to be played by anyone for at least 2000 years. One of the hardest things about game unveilings is that you'll usually wait a year or two before you can finally play the thing. Anyone who anxiously counts down the weeks before a pre-order arrives understands this feeling, but that wait is a cakewalk compared to Jason Rohrer's timeframe. The designer behind Passage, The Castle Doctrine, and Diamond Trust of London has crafted a very special board game whose intended audience won't exist for at least 2000 years. And to ensure that nobody finds it before he's good and ready, Rohrer has buried the game and its rules in the Nevada Desert where even an organized search could take lifetimes. Rohrer's A Game for Someone was designed for the final Game Design Challenge at GDC 2013. Using the theme of "Humanity's Last Game", Rohrer was inspired by cathedral architects whose projects wouldn't be completed until long after their lives ended. For that reason, Rohrer has done everything humanly possible to ensure that his game won't be played for generations, going so far as to bury it away from roads and populated areas. 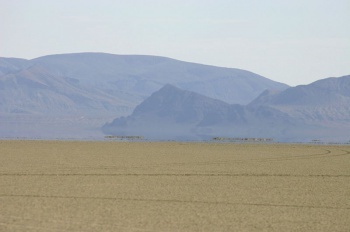 According to Rohrer, the location is so indistinguishable from its surroundings that even he isn't sure how he could find it again. Since traditional playtesting wasn't an option, Rohrer built a digital version of the game to be completed by AI. This version was the one presented at GDC, with key features blocked out to prevent anyone from reproducing its mechanics. After the AI rooted out any imbalances, Rohrer produced the game using 30 pounds of titanium, including an 18 x 18 inch board and pieces. He also included rule diagrams printed on archival paper, sealed in a glass tube, and sealed again in titanium before burying it all in the desert. While no one but Rohrer knows how the game is played, he's still giving players a sporting chance to find it. Rohrer has distributed over 900 sets of GPS coordinates to each person at the presentation, coming to over a million possible locations. Mathematically speaking, if one person were to visit a location each day with a metal detector, the game would be unearthed sometime within the next 2700 years. Short of a massive concentrated effort to find it this generation, it's far more likely that a scavenger or technology-laden futurist will stumble across the game when they least expect it. The only question is whether A Game for Someone, now a GDC award-winner, can live up to over 2000 years of hype.